Publishing Perspectives: You are simultaneously publishing a novella by Brent Weeks in the US and UK in both e-book and audio formats in June. Why did you make the decision to try this venture? Tim Holman: It became apparent to us some time ago that digital publishing provided an opportunity to present short fiction to the market in a different way. We also felt that digital readers might provide a new audience for works of shorter length. The Orbit Short Fiction program (www.orbitshortfiction.com) launched last month, and during the course of its development Brent and his agent told us that he was working on a novella set in the world of his Night Angel Trilogy. The series has sold over a million copies worldwide and is available in both print and audio editions, so it’s natural that we would want to make the novella available as widely as possible and at a price that works for all parties. This seemed to us the best way to achieve that goal. PP: Though you are focusing on the US and UK, what other markets are you working with directly? TH: We are expecting the novella to be available in exactly the same markets as all our e-books being published in the US and UK. Its distribution is through the same channels. PP: What has been the biggest challenge of publishing simultaneously worldwide? TH: In due course, I think it’s likely to prove easier to publish simultaneously in digital-only editions compared with print. Production schedules should be easier to synchronize, for example, and local market conditions perhaps less variable. The current challenges are mostly related to the novelty of the enterprise, requiring new systems to be set up or existing systems modified. Everything can be done, but on a number of occasions — contractual, editorial, promotional — we’ve realized that things have to be done slightly differently. We’ve also had to make sure that we are making good publishing decisions for local markets, while thinking globally and while seeing those markets change rapidly. PP: What are the benefits of publishing in the US and UK at the same time versus staggering release dates? TH: Promotional efforts can be coordinated, word of mouth can be louder, and fans don’t get angry! 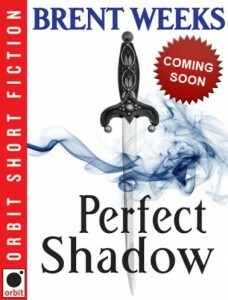 PP: Will there be a print version of Perfect Shadow? TH: Yes, there will be a limited edition hardcover edition from Subterranean Press, published later in the year. PP: Perfect Shadow is a novella, do you see yourselves doing this for full-length fiction or will you reserve this for only your short fiction program? TH: If you mean digital-only publishing, yes. We’re publishing our first digital-only novel later this year, and it will be published by Orbit in the US and Orbit in the UK. We share quite a few authors, and we routinely publish their books simultaneously. The same principles are likely to apply with our scheduling of digital editions. PP: Do you have other releases like this set for later in the year or are you going to use this as a test case to judge the success of the program? TH: We’ll certainly be looking at the results very closely, but at the moment every piece of digital publishing is adding to our understanding of the market, our ability to make good publishing decisions, and our ability to anticipate how the landscape might change. We don’t have any specific projects to announce, but there will be increasing digital publishing activity that is not derived from our print program, and is tailored to the digital marketplace. I think it will be really exciting to see more variety in the kind of stories being published, and we very much hope that Brent Weeks’ Perfect Shadow is the first of many novellas published by Orbit in this way.